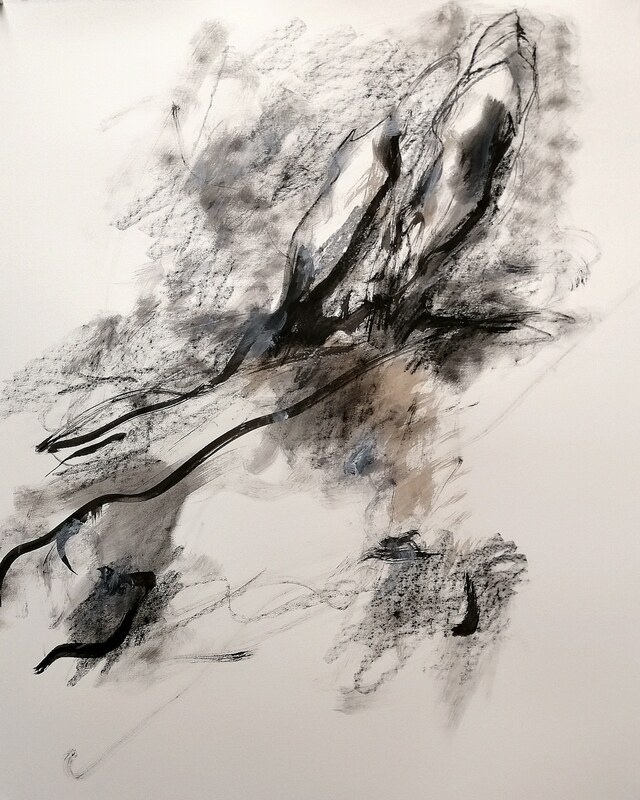 drawing, "tussen schaduwen en lijnen", 77x56cm, mixedmedia, 2019. In the Studio, my table, 2019. French-Dutch artist Danielle Vidal-Ausseil has lived in the Netherlands for decades, where she has earned her stripes in the world of drawings and as a member of the Dutch Circle of Draughtsmen. In her home town of Perpignan in southwest France, Danielle studied Economics at the University of Perpignan and Arts at the Ecole des Beaux-Arts. After completion she gradually devoted herself more and more to the arts. In 1986 she had her first exhibition in a gallery in perpignan. A review of this exhibition was entiteld "Dans la mouvance des arbres", "In the movement of the trees". Now, more than thirty years ago, "space and movement" remains a recurring theme in all facets of her work, the essence of her seach. She creates inner, monumental landscapes of an organic and abstract nature : rolling stones in a desert landscape, moving trees in the wind or landscapes that provide access to another reality as doors. Danielle was inspired by contemporary artists of various genres, including Richard Diebenkorn, Cy Twombly or Anselm Kiefer. drawing, untiteld, charcoal-graphite-china inkt, 29,7x21cm, 2019. Drawings on the wall, from the series "schaduwen", 2019.
drawing, from the series "schaduwen", 100x70cm, mixedmedia on licht beige paper, 2019.
drawing, from the series "schaduwen", 50x35cm, mixedmedia on licht beige paper, 2019. In my studio, brushes and pencils, 2019. My studio with several drawings on the wall, 2019.
drawing, from the series "silhouetten", 100x70cm, mixed media on light beige paper, 2019.
drawing, mixed media on light beige paper, "humus", 50x35cm, 2019.
drawing, mixed media met collage on beige paper, from the series "silhouetten", 30x21cm, 2019.
drawing, mixed media on beige paper, from the series "silhouetten", 30x21cm, 2019.
drawing-collage, mixed media, 21x30cm, 2019.
drawing, from the series "dans la mouvance des arbres", mixed media, 100x70cm, 2019.
drawings, mixed media, from the series "trees and rocs", 4x 50x35cm, 2019.
drawing, untitled, graphite-china ink- acrylic, 100x70cm, 2018.
drawing, untitled, charcoal-graphite-china inkt, 100x70cm, 2017.